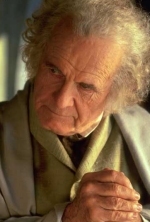 Ian Holm plays Bilbo Baggins, Frodo's cousin, who originally found the One Ring in Gollum's cave. Sir Ian Holm Cuthbert was born on September 12, 1931 in Goodmayes, England, UK. He graduated from the Royal Academy of Dramatic Art. He made his theatrical debut in 1954 as a spear carrier in Othello. That might seem such a small role for such a renowned actor. Although he was a late comer into the world of film, not making his debut until 1968 as an Irish gunner in The Bofors Gun, which earned him a British Film Academy Award as Best Supporting Actor. Back to his theatrical career though, he has had international critical claim for his roles in Titus Andronicus and King Lear as a part of the Stratford company which later became the Royal Shakespeare Company. Holm had the honor of being one of the first long term contract, spending fourteen seasons with them, which includes performing superbly in Richard III and Henry V which won him various awards. In 1968, after Holm made his on-screen debut, his career exploded even further. He has been in countless films including his performance in Chariots of Fire as running coach Sam Mussabini, which earned him an Academy Award nomination for Best Supporting Actor. Other film credits include Greystoke, Kafka, Time Bandits, Brazil, Alien, Dance with a Stranger, and Dreamchild. More recent films include Big Night, Joe Gould’s Secret, Night Falls on Manhattan, The Fifth Element, A Life Less Ordinary, Bless The Child, Beautiful Joe and the acclaimed lead in Atom Egoyan’s The Sweet Hereafter. But this is just a chip off of the ice from his extensive acting career. It is interesting to note that since 1976, Holm developed a nasty case of stage fright while performing The Iceman Cometh and left the theater and he has only returned three times since then. Ian Holm has been married three times, the other two times ending in divorce. He has had 3 children from the marriages and one step-child. His son is Barnaby Holm, who is following in his father footsteps. He also had the honor of becoming Sir Ian Holm in 1998, when he was knighted.